Many pain management providers look to design specific pain monitoring protocols based on Industry Guidelines, individual patient risk for substance abuse and misuse, and a consistent program for tracking patient aberrant behaviors. Dominion Diagnostics offers a unique level of support to customers looking to design and implement monitoring protocols that support medical necessity. Dominion Diagnostics offers access to validated risk assessment tools for patient risk stratification. The program aids providers in documenting patient risk level upon intake, helps to flag important changes in patient behaviors including adherence, and assists in documenting and supporting medical necessity. 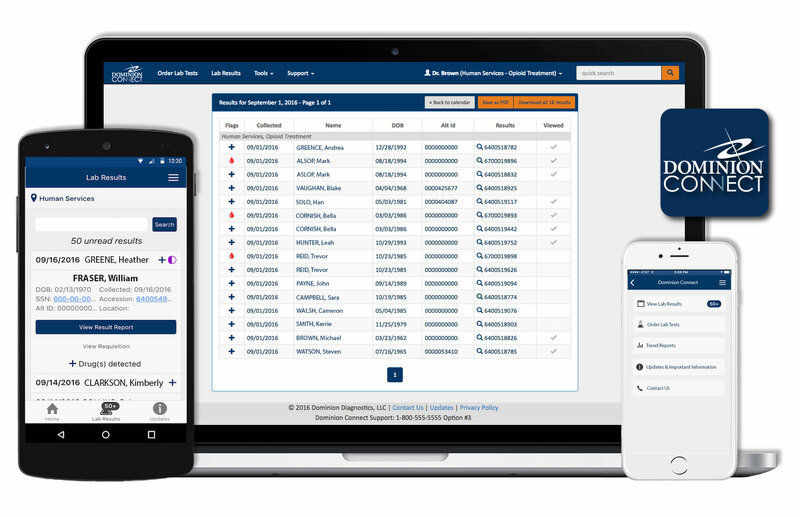 We offer support for scheduling test frequency through our online customer portal, Dominion Connect™. Easily set parameters to manage your testing schedule and choose appropriate patients for monitoring. A comprehensive Patient Test Frequency Report, available quarterly or monthly, will help you track and document your protocol.